BOWLED HIM! NECK AND CROP! Navneet and I decided to play cricket at Nirmal Lifestyle. He won in a 3 over match by beating me by 24 runs. This is one of those moments when the bowling machine castled him(or was it when he hit a boundary? ). I shall assume when it was bowled, as he beat me by 24 runs. Navneet bored me by forcing me to watch "Australia" and slept within 20 minutes of the movie starting. I atleast was awake till the interval, but decided to call it quits after the interval. My friend Prasanna, had come from Chicago on Sunday morning. He left Mumbai shaken and stirred by the crowds that throng the stations. 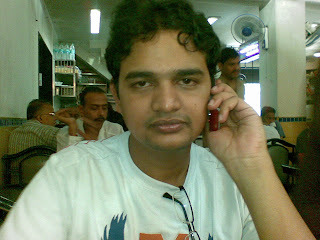 This was taken in a retaurant in Mulund where we washed our stomachs with some sambhar and dosas. I had a long day by waking at 5 am, and picking him up at the airport and taking him through a tour of Mumbai. I had taken him on a long walk in South Mumbai. 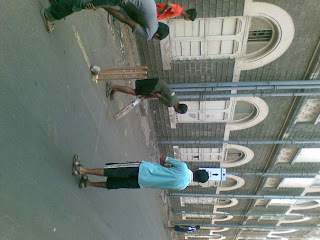 Caught a few kids playing cricket near Cama Hospital. Incidentally the Mumbai marathon was also on at the same time. 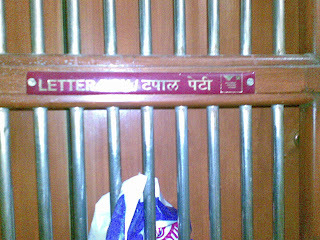 My neighbour's house tag- I thought "Tapal Petti" was a tamil word, learned that its a hindi word also. it was not 48/1 but 48/0 ... bad camera work... or did u get that photo morphed with a tennis ball over there near the stumps... ! be a sport!...gracious enough to accept defeat !... 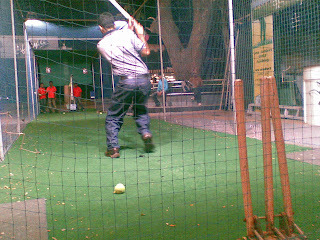 watever... i faced the bowling machine @ 140kph while urs was around 100 or so !... as the adage goes... the faster the come the faster they go to the boundary..